Hi Everyone its blogmas day 6 today and I have had a very busy day today, I was at work all morning then me and my dad have been in town the rest of the day doing christmas shopping for my mums stocking, My mum will love her stocking this year, its so good and I'm glade I was there to help my dad as other wise it would be full of stuff from hawkins bazar. Anyways when we were out I bought the christmas pressent for my giveaway which will be going up tomorrow and I'm supper exited about it. anyways today post is going to be the christmas tag 2013. Do you prefer real or symthetic Christmas trees? As far as I can remember I have never had a real tree always had symthetic, I like symthetic trees but right now we have a kind of really ugly black tree but I have maid it pretty with the red theam we have, also I love my little white tree thats in my room defently with the beautiful light blue theam. Your in a coffie shop, Its december, what do you order? well today when I was out I ordered the white hot chocolate and I really hated it so I will have to say a normal hot chocolate with cream and a flake, I had that all the time last christmas and loved it. 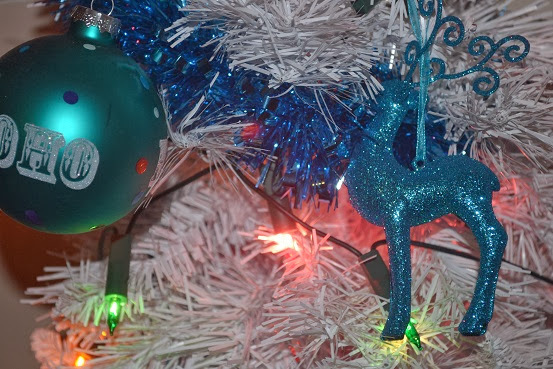 What is your favorite colour scheme for decorating the tree? we change our colour scheme every year but for the black tree I love this red tree we have going on this year, my white tree I really really love the light blue scheme! Both when I was little of corce I loved reciving but now i'm older I love going out and picking the perfect gift for everyone, But I also love Reciving the gifts people have selected spechaly for me. I love Mince pie so much, but I cant eat them as im glutin intolorant. my mums going to try make me glutin free mince pies though so hopfully they work. Whats your troditional christmas lunch? Chicken, Peas, carrots, brussles (minging), stuffing (mums makeing me glutin free), for pudding I ushaly make a triffle even though I dont eat triffle. Actully I now cant basicly eat any puddings so we will see. Pjs then after lunch we get dressed ushaly into new clothes and we used to not were makeup but I do now. I love christmas songs so much, I love that song that goes you scumbang you magot your a cheep lousy fagot happy christmas your arse and thank god its our last, Cant exactly remember the name but I always remeber the words. I also love the song river but the glee version. the santa clause movie is my all time favorite well actully the 2nd one. Open Pressents before or after lunch? Before always before. We wake up at about half 7 this year were getting up at 8 as my sister is now back at home and is refusing to get up at half 7. so we get up at 8 go and get our stocking and go to my mum and dads room. we sit there and open our stockings on mum and dads beds then we have breakfast and open the pressents under the tree, after that we have christmas dinner. So thats the tag, Please do this tag and leave me a link in the comment section. I don't like white hot chocolate either, it's yucky! Its really really yucky. i was so disapointed in it.